More info:Plus local payment from USD 1150. 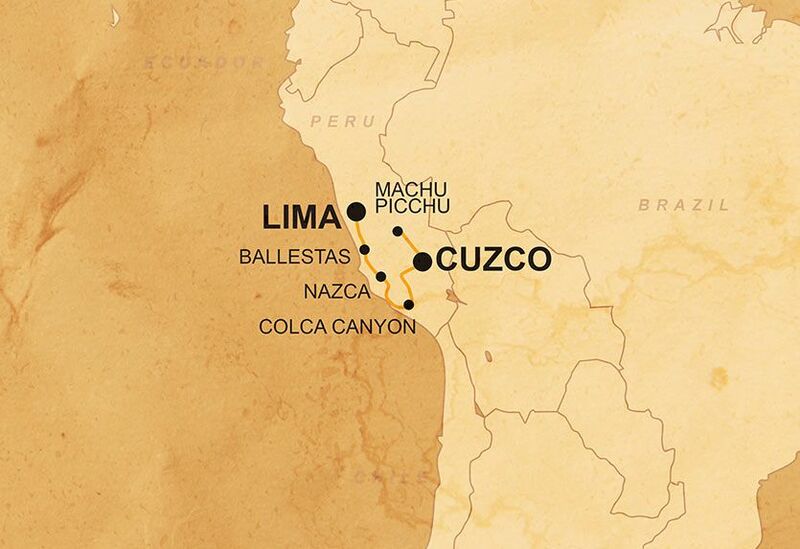 On this epic trip through Peru, we will be traveling overland, using a combination of overland vehicles, boats, buses, and trains, thus cutting out the need for air travel and reducing carbon-emissions. Going overland (by car and on foot for excursions) means you get to experience physically crossing the borders between countries as well as explore places which are off the beaten track. Wherever we are in the world, we prefer to use smaller locally-owned businesses, ensuring that local communities gain a direct economic benefit from our business, for example, we use small locally owned hotels, campsites and activity providers wherever possible. In Raqchi we stay at a homestay within the community, which provides local rural people with tourist revenue and employment, as well as providing a superb opportunity for local interaction. We use local guides and operators throughout the trip; for example, throughout Peru we use responsible local operators that provide training and employment to many local people as guides, providing them with stable employment in the tourism industry. We also feel it is important that our guests immerse themselves in the culture of their host country and we ensure that we weave experiences that will facilitate this into our itineraries. For example, we visit local markets in the villages on the Community Inca Trail and throughout the trip. Since 2005 we have been operating our flagship community-based tourism project in South America, the Tarpay Yachay Community Inca Trek. When setting up the project, our initial aim was to develop an alternative to the extremely popular “Classic” Inca Trail trek to Machu Picchu – one that was grounded in the principles of responsible, sustainable and ethical travel. This is a trekking programme that seeks to genuinely benefit the host communities our groups pass through via education, income generation, and environmental initiatives, whilst protecting the communities from exploitation and giving them ownership over how their environment is used. To date, our groups’ donations have helped improve local schools through refurbishment projects, helped recruit and support the continued employment of a full-time teacher for each community, created designated camping areas with toilet facilities in order to prevent contamination and degradation of open spaces and provide an income for the communities, supported micro-projects to increase the type of crops available to local people in order to improve their diet and nutrition, re-introduced herds or 'hatos' of alpacas after an absence of 200 years (which in turn has allowed alpaca-wool weaving to start in the area, providing revenue for the locals), repaired bridges along the pathways, and together with the ECOAN (a local conservation non-profit organization) have donated 5000 polylepsis (Queuna) trees to areas in danger of extinction in the Lares Valley. In 2013 it was agreed to research a new area through which to trek whilst maintaining the original ethos behind the project - that of combining benefits to both trekkers and local communities. A new route was created, traveling through an even more stunning mountainous area, thus bringing income to new communities and opening up parts of the Andes which had previously little contact with the adventure tourist.